Far-UV Sterilray™ lamps are unmatched in power and efficacy. Far-UV Sterilray ™ Lamp life is measured in years rather than months. Far-UV Sterilray™ is a shorter wavelength than UVC (254nm) with much higher photon energy that breaks the molecular bonds of all organisms. All viruses, bacteria and spores are made up of these bonds. The Sterilray Autonomous Disinfection Vehicle (ADV) is a programmable, state-of-the-art robotic instrument manufactured to highest standards of tolerance and performance by a top US manufacturer using patented, proprietary Far-UV Sterilray™ technology and the Ava Mobility Base. Disinfect 10-12 OR’s Every Night without human intervention via an Easy-to-Use iPad Controller. The Air Surface Disinfection Unit (ASDU) will produce a high level of disinfection on all surfaces exposed to the Far-UV Sterilray™ lamp and will disinfect the air in the room with ‘kill-on-the-fly’ demonstrated capability. 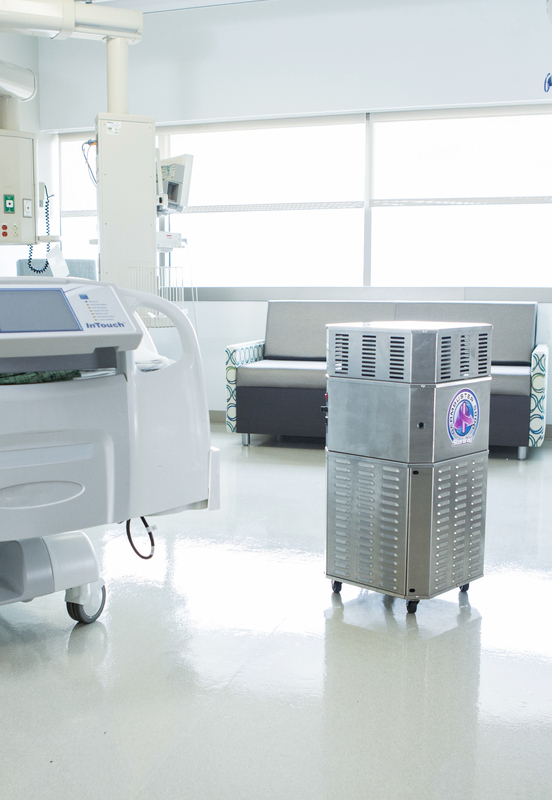 The Air Surface Disinfection Unit is ideally suited for nightly disinfection of surfaces and air, but it can also provide disinfection between room occupation throughout the day. Use the Pathogen Reduction Box (PRB) to disinfect high touch items that are frequently passed from patient to healthcare worker and/or from worker to worker. It will produce a high disinfection level on any object placed inside. Use to quickly disinfect movable patient items, TV remotes, stethoscopes, oximeter probes, pens, glasses, cell phones, etc. An automatic cut-off makes the PRB operation very simple to use. GermBuster-Air – ONE-FIFTH OF A SECOND … That’s all it takes for Far-UV Sterilray™ to eliminate 99.98% of the world’s most harmful bacteria at 500 cfm in an airstream. With unmatched speed, convenience, and effectiveness, the GermBuster-Air is changing the world of HVAC air handling installations through its groundbreaking use of Far-UV Sterilray™ technology. GermBuster-CanAir – Destroy microbes that are affecting the health of your air-quality 24/7. Far-UV Sterilray™ will kill everything in the air that could affect your plants/crops 24/7. 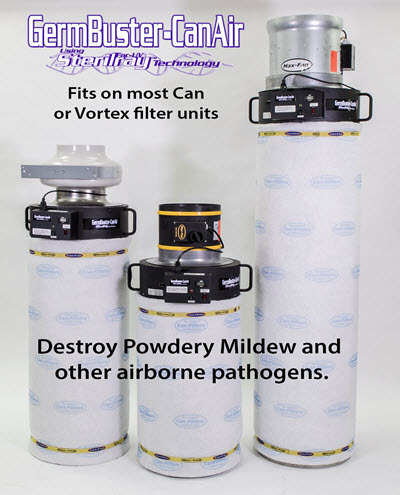 Add the unit to your existing Can-Filter or Vortex system in minutes. Unit can be run 24/7 even in rooms while dark. Exceptional long life for both lamp and power supply. 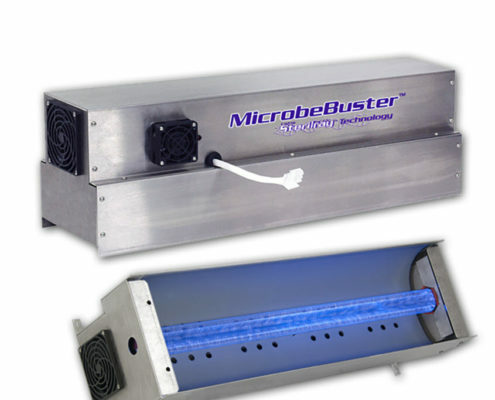 MicrobeBuster™ Surface Unit – Far-UV Sterilray™ surface treatment units are designed to safely and effectively disinfect surfaces, conveyors, packages, food, bottle caps, etc. at all critical points along a production line. Increase the food safety objective by using multiple units throughout your facility. These economical fixtures are available to be customized to your application. Units can be used in series or parallel to achieve the desired level of disinfection. The Far-UV Sterilray™ Disinfection Wand (SDW) will produce a high level of disinfection on all surfaces exposed to the Far-UV Sterilray™ lamp and will disinfect the air in the room with ‘kill-on-the-fly’ demonstrated capability. The SDW is ideally suited for nightly disinfection of surfaces and air, but it can also provide disinfection between room occupation throughout the day. Use the SDW to disinfect high touch surfaces that patients or health care workers frequently touch. Use to quickly disinfect 45 high touch areas in patient rooms in about 10 minutes. The SDW is ideal for disinfecting areas that are seldom treated, like nurses’ stations, keyboards, mice, chairs, curtains, papers, notebooks, and electronics. 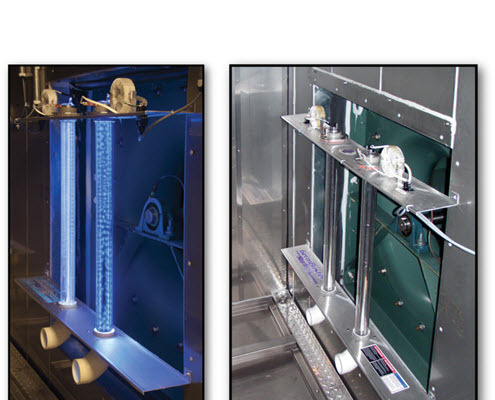 The GermBuster-AirDuct is designed to attack pathogens in HVAC systems. The same Far-UV Sterilray™ breakthrough technology that is now being used in hospitals to combat health care infections, is now available to disinfect the air in your home. 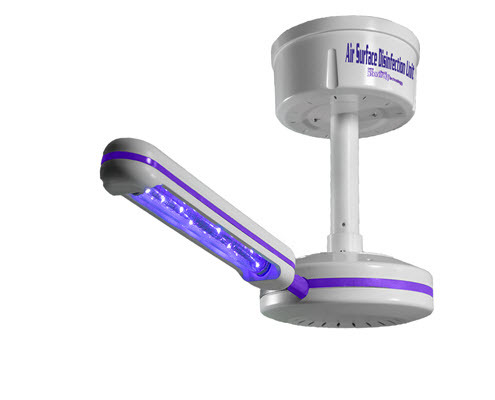 Far-UV Sterilray™ achieved a 99.98% kill of pathogens in the time it takes for the airstream to pass by the lamp. It also destroys mold and allergens in these systems. Contaminates include germs, dust mites, fungus, molds, bacteria, and viruses. Flu viruses and other pathogens are microscopic and are transmitted in the air. 1 in every 5 Americans suffers from ailments related to indoor air quality. Use the larger Pathogen Reduction Box (PRB) Model S1000 to disinfect items that are frequently passed from patient to healthcare worker and/or from worker to worker. The (PRB) Model S1000 uses lamps over and under an object placed inside on the special plate. It produces a uniform illumination 360-degrees to disinfect sides and surfaces. The stainless steel rack will produce shadowed areas. Flip the object over and run a second cycle to insure a high-level reduction. 99.999% (log 5) reduction of MRSA and VRE is achieved in 60 seconds. Far-UV light refers to another wavelength in the ultraviolet spectrum. Far-UV Sterilray™ lamps are the only ultraviolet device that can produce light in this wavelength. Far-UV Sterilray™ wavelength is in the Far UV band with much more photon energy than mercury-based 254nm UV-C bulbs. UV-C light takes a long time to be effective. 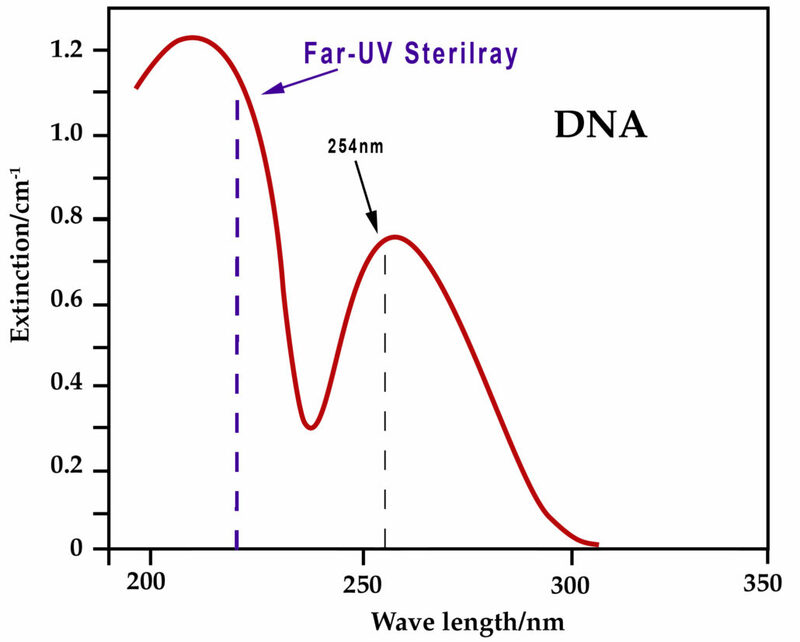 Far-UV Sterilray™ targets the nitrogenous bases in the DNA that have higher absorbance for this wavelength. The higher energy photons can either break bonds in these bases or sever links preventing the organism from replicating. Far-UV Sterilray™ will also break the peptide bonds or the disulfide bonds in the microorganism’s proteins that will further ensure that the microorganism is killed in less than one second. How does it affect germs? The Far-UV Sterilray™ uses a new far UV source that targets the 4 bases that make up the DNA. Its wavelength is close to the peak absorption of protein peptide and disulfide bonds that form the outer membrane of bacteria and the outer spore coat of spores. A 1000x micrograph (micrograph) shows the sidewall rupture and blown off segments of the Bacillus atrophaeus. A great advantage of Far-UV Sterilray™ is the treatment of affected areas can be speedily accomplished while people are present and that it can be applied as often as necessary. Far-UV Sterilray™ can disinfect rooms on a daily basis even while people are present. Independent tests show Far-UV Sterilray™produces a high level of disinfection of bacteria, viruses, and spores. Far-UV Sterilray™ will kill most germs 99.99% in less than one second and 99.9% reduction in about 0.5 seconds. For the first time, it becomes practical to do high-level disinfection with the sweep of a wand. Tests conducted by independent labs, including Microbiology Research Associates, have demonstrated a high level of disinfection for MRSA, Acinetobacter and Bacillus atrophaeus. Is it safe compared to UV-C? Using the best information today, Far-UV Sterilray™ is at least 10-100 times less harmful than the UV-C radiation to both eyes and skin. Unlike UV-C, it does not cause DNA problems in humans since it is absorbed at the surface and does not penetrate into live tissue. Tests are planned to confirm this analysis. 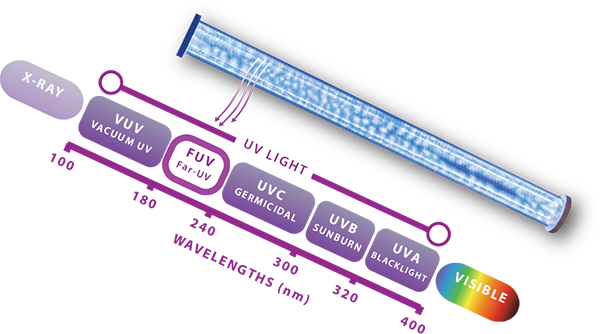 What’s the difference between Far-UV Sterilray™ lamps and conventional UV bulbs? Far-UV Sterilray™ lamps are stronger, work better, and last longer. Far-UV Sterilray ™ Lamp life is measured in years rather than months. They are much less sensitive to air temperature and can be turned on or off without affecting lamp life. The lamps are RF excited and do not contain glass to metal seals that can lead to fragile joints and become easy to break. Independent testing proves that Far-UV Sterilray™ output is significantly better than UV-C bulbs at all temperatures and is not subject to the vibration and mechanical stress limits that these bulbs have. 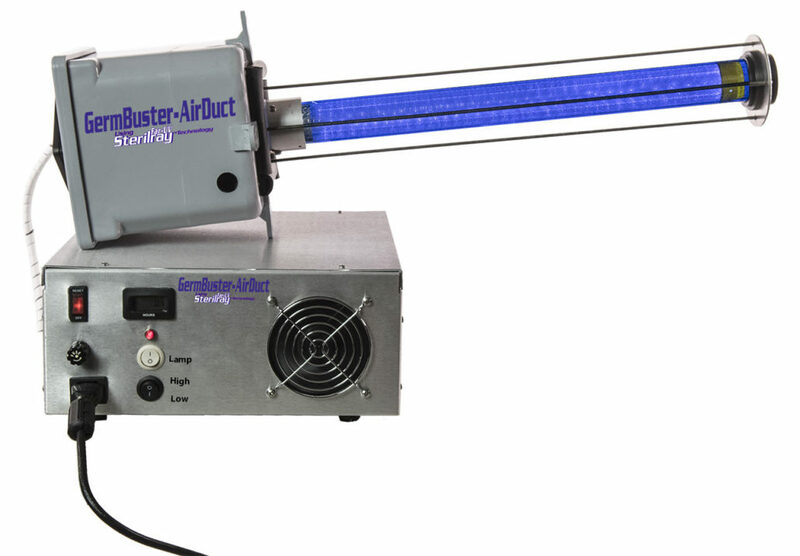 Does a Far-UV Sterilray™ lamp contain Mercury? No. The lamps contain no mercury. It also does not use electrodes that degrade the performance over time. Is Far-UV Sterilray™ more effective than chemical cleaners? A study at Leeds University (Comparison of UV C light and Chemicals for Disinfection of Surfaces in Hospital Isolation Units, Infection Control and Hospital Epidemiology, July 2006, Vol. 27, No.7) compared UV-C light and chemical disinfection in hospital isolation units. They found that after a standard cleaning of these units, the additional use of UVC significantly reduced the numbers of colony-forming units. Since Sterilray can be more than 1000 more effective in killing these microorganisms, then a general cleaning with Sterilray disinfection following will produce even better results. This becomes particularly important since Sterilray is very effective in reducing MRSA, VRE, and C. difficle. Other studies have shown that standard cleaning can miss up to 40% of the contaminated surfaces. Following the standard procedure with a separate Sterilray operator to disinfect the same room will significantly reduce the possibility of missing this amount of surface.